Tokyo (CNN) Our skin is our largest organ. A gateway between our brain and the rest of the world. Imagine then a scene where skin could communicate what's going on inside a human body. It could inform surgeons, provide alerts when our body is about to fall ill, or even diagnose diseases inside another human being, simply through the sense of touch. University of Tokyo scientist Takao Someya is making that scene a reality. Someya has invented a bionic, or electronic, skin (e-skin) with the potential to bestow amazing new powers of sensitivity upon humans. It is as light as a feather, yet almost indestructible, and could one day change the field of medicine. Someya says one of his main aims is to make his e-skin comfortable to the point that people forget they are wearing it. Naoji Matsuhisa, a doctoral student of Japan's University of Tokyo, demonstrates a printed elastic electric conductor on a fabric which can be stretched to more than three times its original length. This technology can be used to make wearable devices embedded with biometric sensors. In 2008, Someya's team made the skin both flexible and stretchable, by incorporating into the design an elastic sheet containing carbon nano-tubes that can conduct electricity. Someya's team hope the technology in their e-skins could enable prosthetics to communicate with the human brain in order to become more effective. The design consists of organic sensors and transistors laid in a grid format onto an ultra-thin plastic substrate. It can also withstand being crumpled without breaking. The skin is flexible enough to bend around circular surfaces. The technology is ultrathin -- less than two micrometers thick -- and sensitive to pressure and temperature, while being lighter than a feather in weight. This may look like a chocolate wrapper, but the incredibly sophisticated e-skin has flexible integrated circuits and a touch sensor system, which can be used as wearable healthcare sensors. Pictured, Someya with his e-skin. In 2003, Takao Someya, Professor of electrical engineering at the University of Tokyo, had the "futuristic" idea to invent an e-skin that would enable a robot to gauge a person's emotion simply by shaking their hand. Someya is striving for a future where doctors wearing a bespoke glove made from his technology could detect a tiny tumor hiding inside a woman's breast, simply by feeling it. This would reduce the need for referrals and scans and could potentially detect tumors earlier -- during routine checks. These wearable e-skins, either tattooed onto our bodies or sewn into our clothes, could also be used to monitor our vital signs and even help medics predict future heart attacks, by monitoring our heart signals. Someya plans to make this happen within the next few years. However, this vision of his began with robots -- not humans. "I imagined this futuristic scene where a robot shaking hands with someone could detect their emotion -- like passion, or sorrow." Creating e-skins for robots, he thought, would be a new research trend outside the saturated area of more commercial electronics, which at the time either focused on miniaturization or making machines faster. Today that vision seems far less futuristic when compared to the technology he has since pioneered. "In the early 2000s, when I started out, flexible electronics were getting popular, but most people were trying to develop e-paper," says the professor of electrical engineering. "I wanted to do something outside the mainstream." Artificial skins already existed, but they weren't very good. The ones capable of detecting temperature and pressure were not flexible and were instead only rigid electronic materials that had some level of function. They were also too expensive to be manufactured in large enough quantities to cover a robot. Someya wanted to tackle all of these limitations, but it wouldn't be easy. Human skin is marvelously complicated -- it is not an easy thing to mimic. Someya knew that wiring two million sensors into a circuit driver would kill the flexibility of any e-skin. His desire for flexible skin called for flexible thinking and what Someya did next established him firmly as a visionary in the world of artificial intelligence. In 2003, he began swapping rigid electronic materials -- such as silicon -- with flexible, organic materials such as dinaphtho thieno thiophene (DNTT), a material often used on the security foil strips found on banknotes. Firstly, he opted to connect sensors, with the ability to detect pressure and temperatures between 30 degrees C to 80 degrees C (86 degrees F to 176 degrees F), with organic semi-conductors that were naturally soft and biocompatible -- the ideal material for e-skin. He then laid these materials on the type of "active matrix" grid system traditionally used in LCD displays, enabling each sensor to have an address it could be located at on the grid. This would avoid the need for tangles of wires. He then had one more stroke of genius up his sleeve. While Someya's peers were placing their sensors on rigid surfaces, such as ultrathin glass and steel foils, his team chose plastic films. Surprisingly rugged and cheap, the plastic would roll around a robot's narrow metal fingers without breaking. It was the first ultrathin flexible e-skin in the world. Despite these successes, there was still one major problem -- Someya's e-skin couldn't stretch. Meanwhile, at Princeton University in the United States, a team led by Professor Sigurd Wagner had begun making e-skins on rubber surfaces -- which could stretch. Someya's team soon took note and began ink-jet printing their organic sensor grids onto plastic films, which were then laminated onto a pre-stretched rubber substrate. When the rubber was released, the plastic film shrunk and wrinkled -- just like skin -- and when the rubber was stretched again, the plastic could expand. The material was able to bend around the grooves of a robot's joint like clingfilm attached to its arm. "That was a truly big jump for us," says Someya. But another soon followed. It may defy logic, but the thinner plastic e-skins get, the stronger they become. Between 2005 and 2013, Someya and his team worked endlessly to create e-skins on thinner and thinner plastic films, until they were just one micrometer thick -- one tenth the thickness of plastic wrap. It has a sensitivity level comparable to that of a human. "At this point we realized the e-skin shouldn't be limited to robots. We started placing the ultrathin film on the surface of human skin," he says. In 2014, the team laid an e-skin over the heart of a rat for three hours during surgery. By taking an electrocardiograph (the recording of electric activity of the heart) with good quality signals, the smart skin was able to detect the position of a heart defect in the rat. "This kind of technique may be used for humans in the future," says Someya. Applying e-skins would put the heart under less pressure than typical electrodes. Zhenan Bao, a professor of chemical engineering at Stanford University, is developing biodegradable materials that would mean e-skins implanted in the body would not need to be removed. "Implantable medical devices could potentially measure the electrical current flow in the heart, the size of certain organs and how that changes with time. They could measure brain pressure," says Bao. on robots, to prevent them colliding with objects -- could be used to detect tiny tumors inside the body that human skin cannot feel. "A doctor wearing an e-skin glove with such sensors could potentially detect a tumor inside a patient's breast, as it is of a different density to the tissue," he says. In 2015, Bao's team released a paper suggesting that ultrasonic proximity sensors -- already trialledon robots, to prevent them colliding with objects -- could be used to detect tiny tumors inside the body that human skin cannot feel. "A doctor wearing an e-skin glove with such sensors could potentially detect a tumor inside a patient's breast, as it is of a different density to the tissue," he says. Earlier this year, Someya's team then revealed an e-skin that can monitor oxygen levels . The readings were brightly displayed through micro-electronic elements that lit up red, green or blue. A superthin e-skin on your hand could be turned into a digital display to view information on the move. It could even be adapted for more commercial purposes, like watching media. Eventually, Someya hopes such skins will be used to monitor oxygen levels inside organs during surgery. 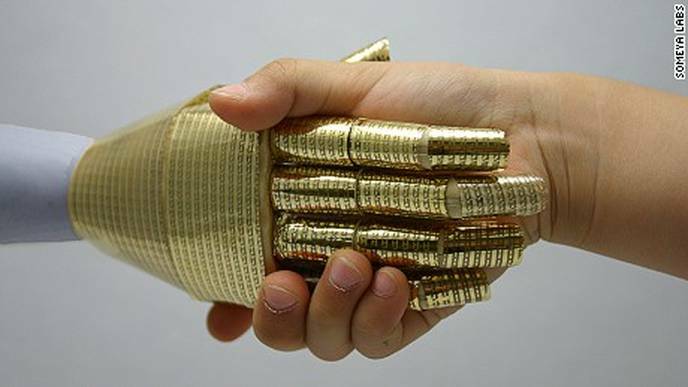 Yet another application for the e-skins could be to improve the abilities of modern-day prosthetics. If placed on a human's upper arm, the smart skin could detect signals from the brain and potentially transmit signals informing a prosthetic arm to move. The opportunities are endless -- and not just in the field of medicine -- including huge potential in the world of gaming and personal health tracking. Last November, Someya invited Ichiro Amimori -- a member of his research team -- to launch a spin-off venture company for the work done at the Someya Lab. At the world's biggest tech fair CES 2016, Amimori unveiled motion capture suits for use with virtual reality gaming. Machine washable, the suits have sensors that monitor motion, breathing, and body temperature as they are built into a circuit-board design within the fabric. "A player could control a boxing game just by their own movements," says Amimori. His team has also developed motion sensor suits for infants, allowing parents to monitor their child's movements when they are not in the room. "Right now these products are in prototype phase, they're still quite futuristic," says Amimori. "But it's coming. We have a road map to take Someya's science into the actual world." Since his breakthrough, Someya says the field of e-skin has exploded, with teams around the globe working to eliminate the remaining barriers towards making them wearable. But his dreams for the technology stretch far and wide and are now returning to his original goal of uniting humans with their technology. "The ultimate goal, our dream, is to harmonize humans and robots by making full use of soft electronics," he says. "So humans get closer to robots and robots get closer to humans."